Energy and the Environment, 3rd Edition examines several critical topics of global importance associated with our increasing use of resource consumption and its impact on our environment. 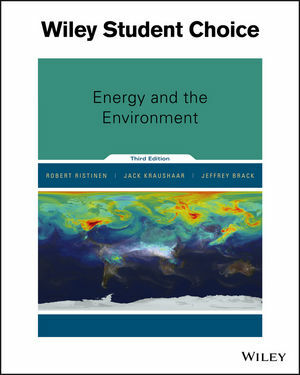 Author, Jeffrey Brack, provides updated information on pivotal issues that surround the study of energy through the exploration of basic concepts, resources applications, and problems of current interest. Chapter 1. Energy Fundamentals, Energy Use in an Industrial Society. Chapter 2. The Fossil Fuels. Chapter 4. Renewable Energy Sources I: Solar Energy. Chapter 5. Renewable Energy Sources II: Alternatives. Chapter 6. The Promise and Problems of Nuclear Energy. Chapter 2 includes a discussion of the risks of pursuing remote reserves, using the Deep Horizon Spill as an example. Chapter 4 and 5 include recent trends in home solar installations and the most recent and largest solar and wind farm installations. Chapter 6 includes discussion of the Fukushima Daiichi nuclear disaster, its lessons, and its sociopolitical implications for the future of nuclear energy. Chapter 7 includes coverage of smart grid implementations being adopted by many utility and municipality providers. Reviews the basic concepts, resources, applications, and current problems and concerns as they relate to energy. Highlights the major environment concerns. Updated to include the most recent developments and events.